Nazriya Nazim Facebook page crosses 6 lakhs likes officially. Young actress Nazriya Nazim who had made her presence in malayalam and tamil film industry has really given a shock to the fans of other actors too. The page which started in December 2012 has crossed the landmark after her popularity crossed the borders. Can other stars win the race against Nazriya in facebook. Wait and see. Young actress Nazriya Nazim may not be the affluent celebrity in Kerala, but she would be the richest malayali in facebook. The charming Nazriya who made her presence on small screen as an anchor is now one of the most wanted actress in malayalam and tamil film industry. After making her presence on big screen, Nazriya is gearing up to keep herself active on the popular social media site, facebook. 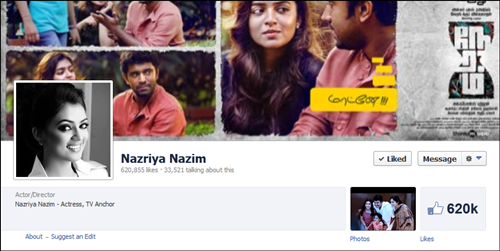 The official Facebook page of Nazriya has crossed 6 lakh which has really given a shock to the fans of other actors. The page which started in December 2012 has crossed the landmark after her popularity crossed the borders. Other than having healthy competition in theatres, now the biggest challenge is the race to win the hearts of facebook face too. With many actors straggling behind, superstars Mohanlal and Mammootty could keep their official page active with updates. Mohanlal is the most active celebrity in Kerala who has got more likes for his official facebook page. While this article gets published (13th June), here are the details of fan followers for popular artists. Even though the fans of various actors have difference in opinion about the number of likes which has been gathered by Nazriya's official page, the fact is that, Neram had gathered the eye ball of the tamil movie lovers after the release of her latest Tamil- Malayalam film Neram. Now the actress is in second position which Mohanlal still maintains the first position. With Thirumanam Ennum Nikkah, Raja Rani and Naiyaandi are under production, the actress would gather more support in the near future. She would be luckier to work with Jai, Arya and Dhanush. Starting her big screen debut with Palungu, Nazriya has also performed in Pramani and Orunalvarum and Mad Dad. So, ready for the real game of facebook page war? It's Nazriya vs Mohanlal and Mammotty.